Got the cards finished early this time! These use the new stamp set called Pennant Parade. LOVE that set! As you can see, it's not just pennants (AND there's a punch to match, woohoo)! Stay tuned for details on the launch of the new Idea Book & Catalog today!!! (Note: the catalog goes live at noon Mountain (11:00 AM Pacific), so you won't be able to order anything from my business web site before then. ETA: Click on the new catalog (upper left) to see what all the excitement is about! gorgeous cards. 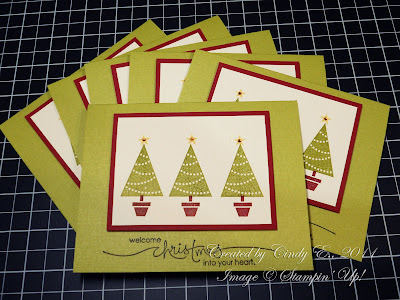 Love the idea of using a penant to make Christmas Trees. Great card! Love how versatile this set is! You know, no one likes an overachiever!! ;-) This is awesome...can't wait to see more of what you make with this set! How pretty! Can't wait to break into the box and play with all the new stuff! How fun to use new stuff for you challenge! Cute cards! I think this set has a lot more potential than people think!